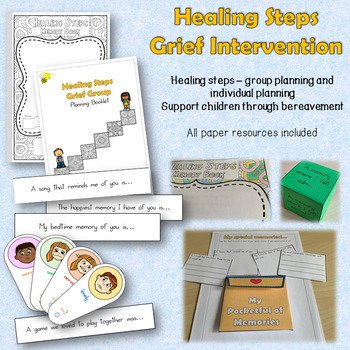 This Healing Steps Grief intervention covers six sessions and is written for a ‘Grief Group’ but also including planning for delivering to one child. This intervention is written for a group of four pupils (but there is planning for one to one working) and is led by an adult. It covers emotions, relaxation and support around grief. This is an ‘activity’ based intervention and the stages of grief are not covered. 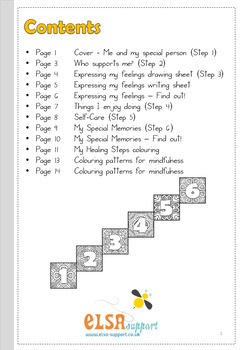 It is meant for pupils to support each other and take part in activities to allow them to share their feelings and make themselves feel more able to cope. 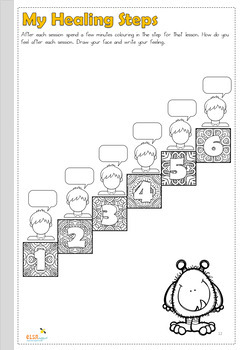 The pupils will take one step at a time and heal a little bit along the way. Animals will also be covered in this intervention because quite often the first loss a pupil experiences is a pet. Pupils will work together in a group which will give them a sense of belonging. It will also help them support each other. Sometimes it is easier to deal with your grief if you know that others are also experiencing similar feelings to you. The sessions will last for approximately one hour. 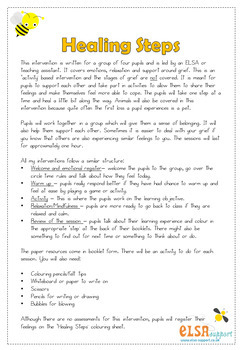 Welcome and emotional register– welcome the pupils to the group, go over the circle time rules and talk about how they feel today. Warm up – pupils really respond better if they have had chance to warm up and feel at ease by playing a game or activity. Activity – this is where the pupils work on the learning objective. Relaxation/Mindfulness – pupils are more ready to go back to class if they are relaxed and calm. Review of the session – pupils talk about their learning experience and colour in the appropriate ‘step’ at the back of their booklets. There might also be something to find out for next time or something to think about or do. The paper resources come in booklet form. There are also some additional templates and you will need some bubbles for each child, drinking straws and water or juice, whiteboard, colouring pencils, scissors and glue.